Since its inception, the organization has distributed over one million food baskets that include chicken, fruit, vegetables and more. But what differentiates Yad Ezra V’Shulamit from other organizations that help the needy, is its desire to change the future for children who are born into poverty. Yad Ezra V’Shulamit organization distributed 1,000,000 food baskets so far – and counting. “I’m not a Prime Minister, or a philanthropist. I started giving out a few baskets and it turned into 1,000,000″, explained Aryeh Lurie, the founder of Yad Ezra V’Shulamit. I just know what it is like to be hungry and that is why I fight to get food to the poor,” explained Aryeh Lurie, the founder of Yad Ezra V’Shulamit. “Growing up poor isn’t a bad thing. When you are poor, not only are you humble, but you develop a sensitivity to others. My parents raised us to think of what you could give up for someone who had less than you. I remember my mother making a cholent of beans and potatoes. The first bowl went to our neighbor who had less than we do,” reminisced Lurie. It is that very philosophy that has stayed with him to this day and prompted him to create Yad Ezra V’Shulamit, named after his two parents. In 1998 Lurie launched a Jerusalem-based non-profit which offered food baskets to 50 needy families who didn’t know where there next meal was coming from. What started as a small and humble organization with two employees, a truck and a driver has grown to one that helps the entire nation and provides comprehensive services to those in need. Yad Ezra V’Shulamit has distributed over 1,000,000 baskets to date. It started when I was a student. I knew there were kids who didn’t eat all of the food they had, so I’d find ways to collect the leftovers and I would distribute it to make sure students got that unused food,” he said. In fact, it has achieved nationwide recognition including endorsement from Prime Minister Benyamin Netanyahu. Since its inception, the organization has distributed over one million food baskets that include chicken, fruit, vegetables, oil, grains, beans, canned goods, pasta and challah. But what differentiates Yad Ezra V’Shulamit from other organizations that help the needy, is its desire to change the future for children who are born into poverty. “The problems begin the moment poverty damages a child’s self-esteem. The path from that place to the street is very short. To stop the cycle of poverty, we have to make sure people’s spirits aren’t broken, especially the children.” said Lurie. “People often mean well, but end up causing damage. I remember as a child standing in a line to get a free bag of potatoes when someone came up to me and gave me a used, dirty, toy. I felt humiliated and terrible. That person thought he was doing a big mitzvah and I ended up crying. The dignity of the poor person is more important than anything you give him,” Lurie reminisced. With the poverty rate among Israeli households at 18.5%, and the rate of near poverty was a further 8.1%; meaning nearly 27% of Israelis are either poor or very close to it. What’s worse is that Lurie sees how poverty transforms into a vicious cycle. “It’s very difficult to put a stop to this cycle. People who are poor can’t invest in the future. They can’t put money aside for their children’s education, save money for retirement or keep some funds stocked away in the event they get sick. They can’t afford a tutor or afternoon activities or even a trip to the dentist,” Lurie said. How, then, does Yad Ezra V’Shulamit help the needy? On any given Wednesday afternoon at the main headquarters in Jerusalem, volunteers can be seen packing carrots, potatoes, onions, canned goods, bread, and chickens into hundreds of individual baskets. Finally, with Passover around the corner, Yad Ezra V’Shulamit is committed to helping the needy during the time of year when poverty is most acutely felt. Although the Welfare and Finance Ministries offer a food budget allocation for Passover, at a meager 13 shekels per family, the state funding doesn’t cover the price of a box of matza. 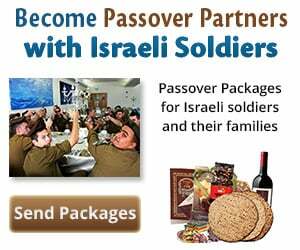 “This Passover we will distribute 30,000 food baskets to people throughout the country. It’s a lot of work but when I sit at my Seder table, I know I did everything I could to provide food to needy families. That is the biggest joy of all,” Lurie said. To donate, click here.